On behalf of all the WBCG comittee, we extend a merry Christmas to all our members, friends and supporters. 2012 is shaping up to be an exciting year and we're all looking forward to some fun times ahead. WBCG Raffle will be drawn at the Christmas Party! Tickets still available for purchase on the day. Thanks to everyone for your huge efforts to make this year's Living Smart Festival stall such a success. Many people behind the scenes contributed a huge amount of time and effort to ensure the success of our stall. We had so many great conversations with so many great local people. We spoke to hundreds of friendly local residents who were interested and supportive of the community garden. From the many kids whose eyes lit up as they had their face painted to all the backyard gardeners who bought our beautiful organic seedlings, the response was fantastic. We also spoke at length to some of the movers and shakers in Lake Macquarie and we got our message out on ABC radio too. We think the ABC chose us because of the contribution we made to the day with the teepees and our group's inclusive community focus. So the thanks for all of that must go out to the members in our group, whose actions speak louder than words. We have shown a level of patience and persistence that was described by a local gardening guru as "a triumph". Every dollar raised at our stall will, of course, go straight back to the community to help build the Warners Bay Community Garden in Bunya Park. We only have a few bags of cow manure left over from the festival. The manure is washed, screened, milled and bagged with nothing added (no fillers). BUSY BUSY BUSY - December is always one of the busiest times for the home gardener. Recommendations: Basil , Beetroot, Capsicum, Chilli, Chives, Climbing beans, Cucumber, Dwarf Beans, Eggplant, Lettuce, Okra, Oregano, Pumpkin , Radish , Rockmelon, Silverbeet, Squash, Sunflower, Sweet corn, Tomato, Turnip, Watermelon, Zucchini. Anyone who has ever encountered fruit fly in their garden knows that sinking feeling when they realise the fruits of their labor have become nothing more than maggot fodder. And lets face it, when you're confronted with the prospect of losing an entire crop of fuit/veg, its very tempting to throw organic principals to the wind and reach for the systemic pesticides to ensure you get something resembling a harvest. Organic sprays are readily available from local nurseries but still require care and effort to ensure success. Exclusion bags work well and are both commercially available or can be made using domestic window screen. Although effective, they are still fairly tedious and time consuming to implement. Try growing susceptible plants very early or very late in the season to help reduce attack. Choose less susceptible varieties - i.e. cherry tomatoes rather than their larger counterparts. Traps can help detect (but not eliminate) fruit fly attacks. If using commercial sprays (organic or otherwise), always ensure you follow the directions to the letter. Encourage friends and neighbours to ensure any abandoned or unwanted fruit trees are not left to go feral. 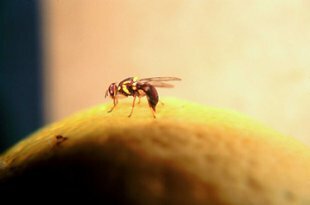 Dropped and rotting fruit will often negate any attempts to control fly infestations in your own crops. If despite your best efforts your crops still succumb to an attack, ensure the infected fruit / veg is disposed of properly - kill larvae in boiling water or even better... feed them to your chooks for a tasty treat!